Health Secretary Enrique Ona has given Php50-million cash assistance for the upgrading of facilities of the Provincial Hospital located in Bad-as, Placer, Surigao del Norte. The check containing the cash assistance was received by Governor Sol Matugas from Sec. Ona during the convention of barangay health workers held on Thursday (Dec. 1) at the provincial convention center attended by more than 2,500 delegates from the 21 towns and lone city of the province. 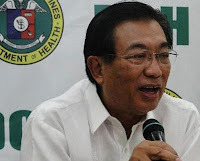 Ona told Manila Standard Today the Php50-million was only an initial assistance from the DOH and another Php50-million will be given next year to complete the upgrading of facilities in the said hospital. “Your provincial hospital must be equipped with complete facilities so that it will attract doctors and can provide competent service to the community it serves,” he said. Matugas thanked the health secretary saying it was a wonderful Christmas gift from the administration of President Noynoy Aquino.